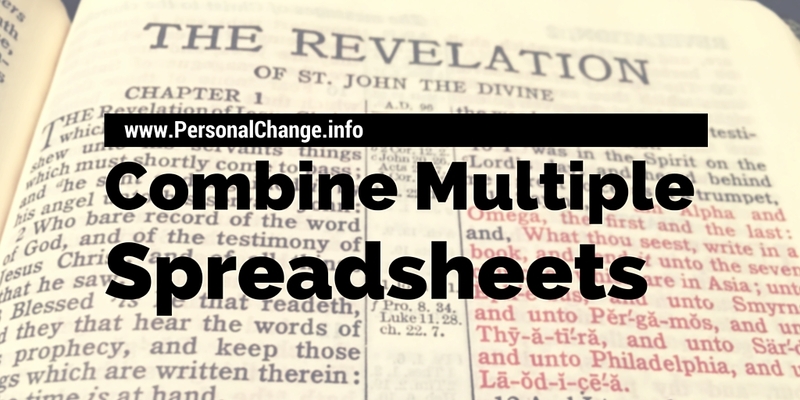 In this post I share about a project where I needed to combine multiple Excel worksheets into one using Visual Basic coding. The code combined 66 worksheets into 1 containing the entire King James Version of the Bible. I have started to work on a book project which requires several texts from the King James Version of the Bible to be included. Rather than type each text into the book, I wondered if there might be a better way. However, when I viewed the Excel workbook after downloading, I realized that each book of the Bible (a total of 66) was included its own individual spreadsheet. In ordinary circumstances multiple spreadsheets would not be a problem, but 66 spreadsheets - far too many. Thus, I returned to the Internet to search for some technique to combine multiple Excel worksheets into one. The best option I found is the one listed below. The Visual Basic code combines all of the worksheets into a new worksheet entitled "Master." The code as written works well for the Microsoft Windows version of Excel. However, it only merged the first column of data on the Mac version of Excel. The Visual Basic code automatically calculates the number of columns to import. When I manually entered the number of columns (2 in my case), the code worked perfectly. All of the worksheets should have the same structure with neatly arranged data and the same number of columns. A large number of worksheets takes a few seconds to process, but the end result saved a lot of time. You can find my combined file at the link below. 1. Copy the code below. Note the highlighted code below to specify the number of columns. 2. Open the workbook that contains worksheets you want to combine. 3. Click on the Developer tab and choose Visual Basic. Activate the Developer tab by selecting Preferences > View and place a check by "In Ribbon, show Developer tab." 5. Paste in the copied code. 6. Run the code using the Play button. 7. You should see the progress displayed in the status bar. "the name of the result worksheet of this process. ", vbOKOnly + vbExclamation, "Error"